"Expedition 33/34 crew members, Soyuz Commander Oleg Novitskiy, bottom, Flight Engineer Kevin Ford of NASA, and Flight Engineer Evgeny Tarelkin of ROSCOSMOS, top, wave farewell before boarding their Soyuz rocket just a few hours before their launch to the International Space Station on Tuesday, Oct. 23, 2012, in Baikonur, Kazakhstan. 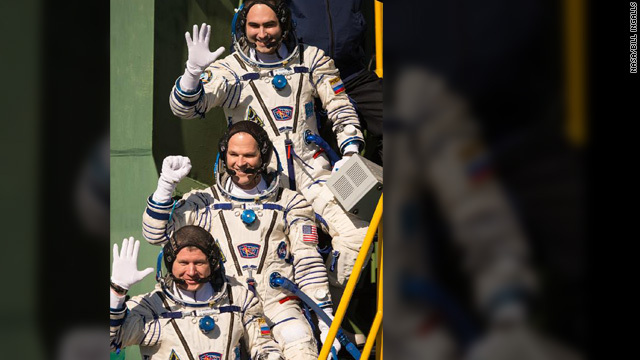 Launch of a Soyuz rocket later in the afternoon will send Ford, Novitskiy and Tarelkin on a five-month mission aboard the International Space Station." Hey Crew over there.. Missing any gold??? it landed in mars..